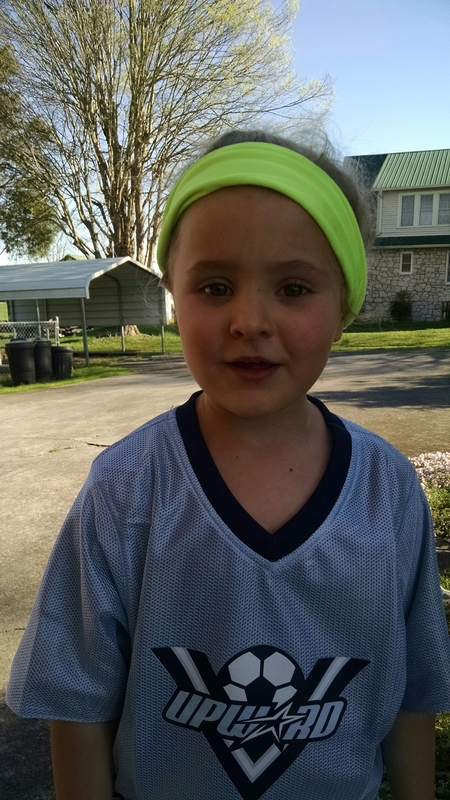 Caroline had her first soccer game today. She’s playing upward soccer. Basically, since they are 4 years old they just run around the field in a little huddle and occasionally kick in the direction of the ball. And then for no apparent reason, one of the kids will randomly fall and dramatically roll…pause to see if anyone noticed..then then they realize the game goes on without them they spring up and scurry back into the pack. Which is probably off-putting to the other parents….I can only assume that since I’ve not made a soccer mom-friend yet. Or maybe my soccer-mom friendlessness is because during practice and games I’m wrassling she-tiger-Claire, furiously slurping coffee and picking up the trash from the snacks Claire is eating/throwing… You know, basically looking like a crazy person. Either way, Caroline enjoys it, Claire enjoys it and I enjoy it -so it’s a win. Thanks! I’ve always marched to the beat of my own drum… So as this point I guess I’ll just keep it up!